Stretch Limo Services. Simple Elegance on Special Occasions. Many people, whether they are getting married or going out on the town for an evening of fun, want to avoid the hassles that go along with driving for the night. This is when renting from a stretch limo services company is a good idea. 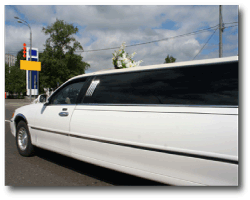 Stretch limousines typically allow for up to six, eight or 10 passengers. There is also a SUV stretch limo that will hold 12-14 passengers comfortably. The things people want to avoid when they rent a stretch limo for themselves and their friends is the parking, traffic, gas, directions and having to drive home after they have been drinking. These are all things that a rented limo could help take care of. Everyone arrives and leave a destination in one vehicle so there is no chance of anyone being late or getting lost. The standard stretch limo is sleek, elegant, and classy and not over the top like a Hummer or other SUV type limousines. Sometimes an event calls for simple elegance and that is exactly what the stretch and super stretch limos will bring to the occasion. When someone is planning and organizing a special event like a wedding, bachelor or bachelorette party, special birthday party, sporting event or one of the many other events that call for someone else to drive several people around, a stretch limo would be the ideal choice. The stretch limo would be ideal for any special occasion in which just a couple of people are going out on the town or a couple is celebrating a special day such as their anniversary or Valentines Day. Some of the stretch limos will have couch seating and a small wet bar while others are equipped with simple seats and dim lighting, romantic lighting. Since the stretch limo services provide several styles of limos for elegant dances like proms, homecoming and other formals, as well as executive business pickup and delivery from the airport and other locations, they are very economical. Many young people will put their money together to rent a stretch limo in order to save their money for other things like a nice dinner or to be able to spend more money on the dresses and other essentials. Renting a stretch limo for business events and airport transportation of larger groups makes sense because they are more economical then the larger SUV limos and some of the Town cars, they also hold more people at one time. They would make great transportation for a seminar or other type of business meeting in which several of the top executives need to be at the same event. Stretch limo services could help a couple or group of people with their limo needs no matter if there are several people going on an outing or just two on a special date. The stretch limo is the standard and still the elegant choice for all occasions.